The Spurs resorted to a triangle and two defense during the 1st half of Saturday afternooon’s loss to the Jazz. Coming off three consecutive defensive no-shows, with each of the Kings, Warriors and Trail Blazers having scored 127 points per 100 possessions or more, the Spurs tried something new. Like the zone defense the Nets threw their way just a week ago, the Spurs’ version found some early success. Just as the Nets had, the Spurs employed their zone after made buckets and dead balls. The Jazz scored just 10 points with 2 turnovers on 10 possessions against the zone in the 1st quarter. That’s not great defense, but 1 point per possession is far better than anything the Spurs have been able to do in Derrick White’s absence. The Jazz got their first look at it after DeMar DeRozan’s and-1 layup off a hand off from LaMarcus Aldridge a minute into the game. Bryn Forbes and Davis Bertans are playing Donovan Mitchell and Joe Ingles in tight man-to-man coverage, attempting to deny the ball whenever they are one pass away. 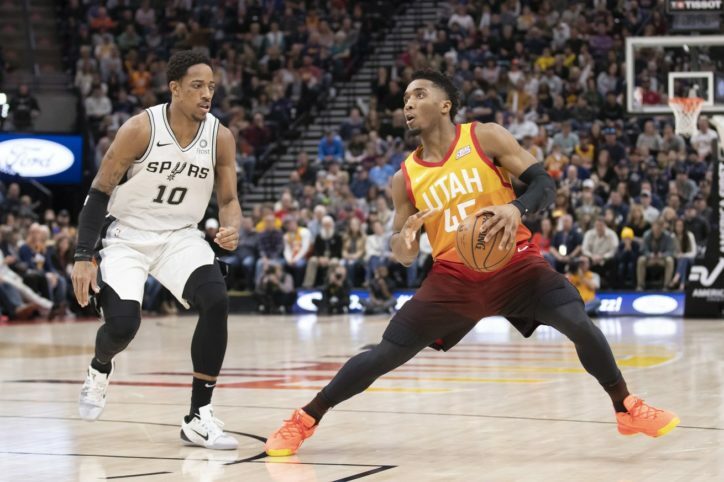 LaMarcus and Jakob Poeltl are on the blocks, guarding the paint and responsible for the baseline and corners if any other Jazz players end up there. DeMar DeRozan is at the foul line, routing penetration away from the paint and occupying the high post area. Davis gets called for a ticky-tack freedom-of-movement foul and the Spurs stayed in the zone for the inbound play. The Jazz get a decent shot here. The triangle and two is susceptible to off-ball screens on the two defenders in man-to-man coverage. Rosy Gobert gets enough of Davis to give Ingles a window to shoot and Jakob doesn’t react quickly enough. Still, with nearly 14 feet of European big man coming at him, Ingles’ corner three is a little short. That’s about how the rest of the quarter went for the Jazz attacking the Spurs zone. They found decent shots, but couldn’t always convert. One of the main impacts of any zone defense is how it disrupts the other team’s offense and that was certainly the case in the 1st quarter. The Jazz managed just 13 points on their other 15 possessions. It appeared the Spurs were done with their zone early in the 2nd quarter, as they played man after both of their made buckets over the 1st three minutes. But after a Jazz timeout at 8:37, and a couple of substitutions, the Spurs went back to it. Unfortunately for the Spurs, the Jazz were ready. They scored 12 points on 6 possessions against the zone in the 2nd quarter, before finally forcing the Spurs to abandon it after a Royce O’Neal three form the right wing with 3:58 to go. For more on the triangle and two defense, check out Hoop Tactics, Winning Hoops, and Coach Jackson’s Pages. You can also read about the Spurs’ zone defense in this game from the Jazz perspective. Unfortunately for the Spurs, their man-to-man defense wasn’t any better. Here’s some of the worst pick and roll defense you’ll ever see. It might be tempting to blame Bryn for this penetration, but he does exactly what he’s supposed to do. He forces Ricky Rubio away from the screen and toward the sideline then stays right alongside him denying the pocket pass. But both DeMar and Jakob fail. DeMar is supposed to delay Gobert on the roll, pushing him off his line if possible, and Jakob has to do a better job of deterring Rubio from attacking the rim. Instead, DeMar just stands there and Jakob retreats all the way under the basket. By the time Jakob commits to stopping Rubio, Gobert is all alone at the front of the rim for an easy two-handed dunk. What’s frustrating about this is that they are clearly capable of doing better. Here’s the exact same play a minute and a half later. Bryn gets it right, again, and is able to recover all the way back into Rubio’s path this time. DeMar does his job, delaying Gobert, allowing Jakob to remain at the front of the rim. With Bryn in good position and the roll taken away, Rubio has to kick it out to Jae Crowder in the corner. The Jazz swing the ball and Donovan Mitchell is able to get by DeMar, but Jakob is waiting for the block. There wasn’t nearly enough of that in this game, though. The Spurs’ defense remains a crippling weakness. White makes up for a lot, but nobody is good enough to make up for teammates who simply can’t or won’t do what they’re supposed to. His return, along with that of Rudy Gay, will help, as will the team’s expected return to the steady rotation that carried them through December and early January. But until every player executes the scheme on every play, they’ll continue to hemorrhage points at a rate that puts a low ceiling on how good they can be.